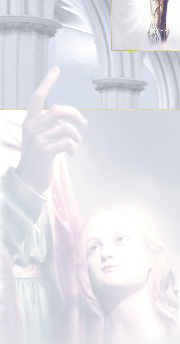 N THE EVENING of Friday, September 13, 1935, Saint Faustina had a vision of an Angel, the executor of divine wrath. Seeing this sign of divine wrath that was about to strike the earth, the saint implored the Angel to stay his hand, and she began to plead with God for mercy on the world. The words with which she entreated God were restated more perfectly the next day in another interior vision in which the Chaplet of The Divine Mercy was fully defined (Diary, 474476). In her diary, Saint Faustina provides a profound description of the role of self-sacrifice and suffering in Christian life. Now, it is true that Saint Margaret Mary Alacoque has, through her writings and her life example, left us a definitive explanation of the meaning of Christian suffering in general, but the modern world, defiled as it is by all the diabolical terrors of modernism beginning with World War I, has its own particularly urgent need for repentance and mercy. And Saint Faustinas Diary expresses this urgency in poignant clarity. 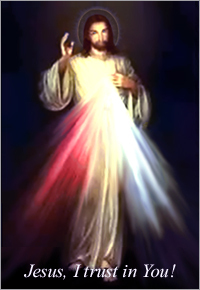 The Chaplet of The Divine Mercy has the full approval of the Church, and so it is fitting that we pray it constantly, that God might mitigate His wrath on a world growing increasingly sinful and corrupt. 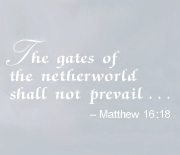 As natural disasters today become more severe and destructive, our prayers must become more intense. The Sign of the Cross. The Chaplet of The Divine Mercy is prayed on traditional Rosary beads. So, to begin, hold the crucifix of the Rosary in your right hand and make the Sign of the Cross, touching the crucifix to your forehead, chest, and left and right shoulders. Make the sign deliberately, and with reverence, for, when you do make the Sign of the Cross, you are mystically accepting the crucifixion of your own identity. That thought should give you pause. By the way, be careful not to slur together the seven petitions of the Our Father (Matthew 6:913) like the elemeno P of the grammar school alphabet. Say this prayer slowly, carefully, and distinctly. 1. This, in itself, is the cause of some pernicious argument today. Some traditional Catholics claim that Church approval of Saint Faustinas writing came about because of liberal Vatican II ideology. Now, the truth is, many liberals today are so theologically ignorant that they have lost respect for traditional ceremony and discipline. But it is just as true that many traditionalists are so conceptually arrogant that they have cast humility from their lives. Therefore, it would do everyone well to keep in mind that real Christianity demands a humble, chaste lifestyle of constant prayer and on-going sacrifices and acts of mercy towards others. The Chaplet of the Divine Mercy is one way to fulfill that obligation in the midst of a battle that, far from being between yourself and others around you, is really between you and the devil.